Sandberg There are 31 products. Arkiv is Sandberg's first digital collection ever. The collection is divided into four sections, and contains a total of 15 printed patterns where traditional craftsmanship meets modern technology. Skog is inspired by man´s ever greater yearning for nature. Our desire to leave the bustling city behind and go to places where we can exhale and take a break from the urban online existence. The result is a peaceful collection with calm, harmonius patterns that open up the room and meet and greet the splendor of nature. Wallpapers with contemporary design created for modern living with open floor plans. The beautiful stonewashed linen texture of Fritiof, which is also found in Maj, creates a cosy, modern look. 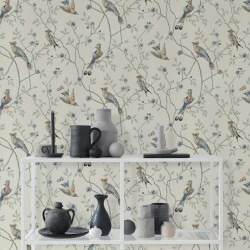 It can be coordinated with all the wallpapers in the Götheborg collection.